UK police confirmed five arrests were made during pro-Brexit protests in London that lasted into Friday night. Demonstrators blocked streets around the Houses of Parliament in central London as lawmakers rejected Prime Minister Theresa May’s EU withdrawal deal for a third time, on the day that the UK was originally meant to leave the European Union. Metropolitan Police tweeted that by 9 p.m. local time, two people had been arrested for assault, one for being drunk and disorderly, one for assaulting a police officer, and one who was wanted for an offense in another part of the country. “I think it’s a scandal. We voted to have a referendum… leaves means leave,” one protester told CNN. Demonstrators were flanked by police, including some on horseback, and officers were seen leaving nearby Downing Street in riot gear. The protesters were also followed by nine police trucks and a helicopter overhead. Friday’s protest was the final leg of the 270-mile long March to Leave rally, which began in the town of Sunderland in the northeast of England on March 16. The first leg was led by Brexit architect Nigel Farage, the former head of the pro-Brexit UKIP party. He was present to greet protesters as they approached Parliament Square. The protest comes after Prime Minister May was forced to ask the EU for an extension to the Article 50 process in order to avoid a no-deal Brexit, after her Withdrawal Agreement was twice rejected in the House of Commons. MPs rejected her Withdrawal Agreement for a third time Friday, likely consigning her deal to history and raising the possibility of a no-deal Brexit or a much longer Brexit extension. Farage addressed the crowd following the result of the’ vote, saying that Leave campaigners would fight on in the event that politicians attempted to delay or revoke Britain’s exit. “What they want is to beat us down, what they want is us to give up, what they want is us to go away,” he said. “Am I disheartened. Am I downcast? No, I am more determined than ever. 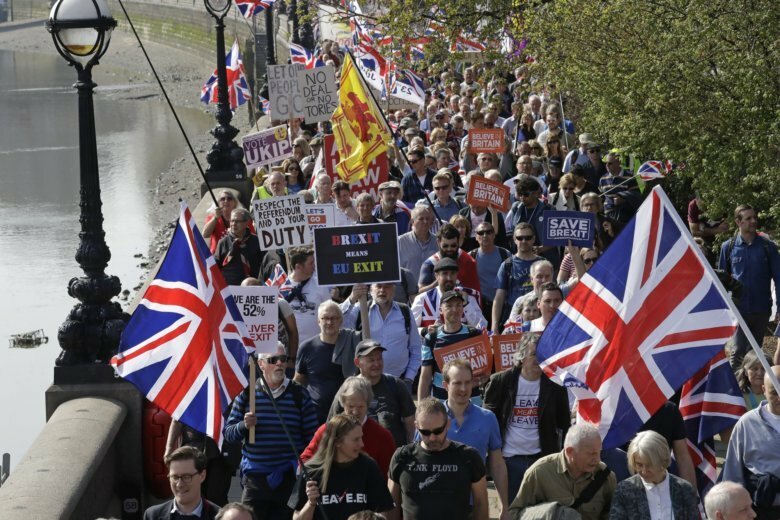 Multiple protests groups were present at the pro-Brexit rally, according to Press Association. It included current UKIP leader Gerard Batten and far-right English Defence League co-founder Tommy Robinson, who made speeches on a separate stage on Whitehall. Robinson, whose real name is Stephen Yaxley-Lennon, told the crowd: “So Theresa May has lost her vote. Many people will be asking what does that even mean. It means we were betrayed. Today is supposed to be our independence day. After the speeches, a crowd of Robinson’s supporters were filmed shoving members of the press, including a CNN cameraman and producer.